World War One destroyed communities and farmland which led to food shortages. One hundred years ago, the Armistice of Nov. 11 brought the fighting of World War I mercifully to an end. 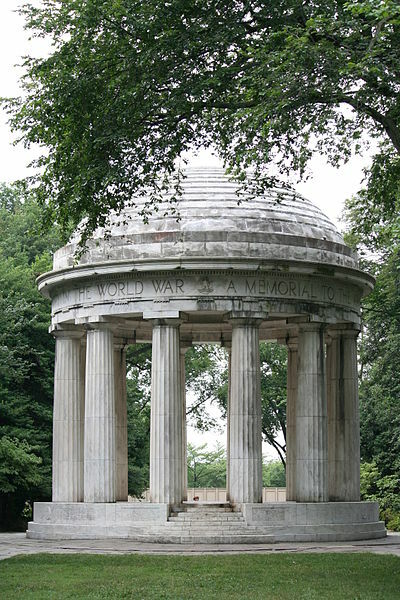 The U.S. and Allies had defeated Germany and the Central Powers in what was called the Great War. As we reflect on this history, let’s remember the timeless lessons of war and peace that emerged. World War I showed not only the horror of armed conflict, but its brutal partner: Hunger. Americans donated to help feed France and other nations in distress. The Congress also passed appropriations supporting food aid for the war victims. It’s vital we remember the Armistice and the hunger that followed. The tragic thing is 100 years later there are still nations affected by war and at risk of famine. Yemen desperately needs a ceasefire, a peace treaty and food aid. The civil war in Syria has destroyed agriculture, which will also take years to recover. Refugees from Syria are scattered throughout the Middle East and with the loss of livelihood they suffer from hunger. South Sudan, a country with fertile land, has seen its farming industry also devastated by civil war. In the Sahel region of Africa conflict and drought have left millions with food shortages. All these nations need emergency food aid. Catholic Relief Services, The World Food Program, Save the Children, Mercy Corps and other humanitarian agencies provide life-saving aid with the generosity of donors. As was the case after the Armistice the goodwill of the public through food drives and fundraisers is needed. With enough funding these nations can rebuild agriculture and grow their own food. Like after the Armistice, Congress is needed to back humanitarian relief through spending bills. Today’s Congress should increase funds for the Food for Peace program to fight hunger in today’s war and disaster affected nations. One thing that was done after the Armistice was providing school meals to children in countries impacted by the war. Congress could further support school meals overseas today by increasing funding for the McGovern-Dole Food for Education Program. With the Armistice came hope of a lasting peace and the end to war and famine. We should never give up on these noble dreams that can inspire us this Armistice (Veteran’s) Day on Nov. 11. Originally appeared in the Bakersfield Californian. What were the news headlines 100 years ago today? Imagine what stories you would see on cable TV or in your Facebook news feed if the year were 1916. The top story would undoubtedly be World War I and the Battle of the Somme, which started in July, 1916. British and French forces took on the German army near the River Somme in northern France. It was a senseless slaughter that claimed thousands of lives even in the first days of the battle, which lasted for several months. Read the full article at the History News Network. As we celebrate this Veterans Day, let’s recall a recent U.S. military mission led by a teddy bear. When the Air Force was called upon to drop humanitarian supplies in Iraq, a soldier attached a teddy bear to the cargo. Captain Thomas Orbison had a critical mission after World War I. Orbison was a doctor with the American Relief Administration. He was assigned to fight hunger in Latvia. Memorial Day is here. It is a chance to remember lost loved ones. There are also the stories of others that may be lost in time, but not in value and spirit. Let’s remember them too. A dedicated soldier, a member of the American Relief Administration after World War I, who lost his life to smallpox while trying to feed the hungry and sick. Or a young lieutenant who was given the task of feeding the starving in Montenegro, a region in Europe that had been devastated during that war. This part of Montenegro was a mountainous area, and with the onset of winter in 1918-19, it was a major challenge to bring relief supplies. Heavy snow had arrived and with damaged bridges and roads, people had given up hope they could be saved. The New York Times reported on the grave circumstances and the rush of American officers to save lives. People were already living off grass and the death rate soared as winter set in. It would be hard for large supplies of food to reach the suffering. The lieutenant replied, “Yes, we can.” He planted an American flag on one of their churches and went to work. The American Relief Administration used cables to swing food over broken bridges. They used burros and horses to move food over miles of snowy mountain trails. That is what American humanitarianism is all about. Helping others, giving them a chance to survive and restore themselves. The American Relief Administration also provided free school meals in war-devastated countries, which brought millions of children back to health. The same thing is being done today in conflict-torn Mali by Catholic Relief Services, through a grant by the U.S. McGovern-Dole program. That program was named after two veterans of the Second World War, George McGovern and Bob Dole. It was Herbert Hoover who said famine is the inevitable aftermath of war. We saw that after both world wars. Only humanitarian aid prevented mass starvation. We are seeing the effect today of war in Syria, Afghanistan, South Sudan and other countries where hunger escalates as a result of conflict. The World Food Programme, the largest hunger fighting organization today, is rushing aid to Syrian war victims as we speak. On this Memorial Day remember too the humanitarian heroes, such as the amazing officers of the American Relief Administration. They were part of the American Army which won a war that many hoped would be followed by lasting peace, freedom for all, and freedom from famine. While those goals have not been achieved, we need keep up the fight for those ideals which they so bravely pursued. This is the best gratitude we can give them. The film industry is having great success. With that comes an opportunity to use its power to fight one of the greatest global threats: hunger and malnutrition. In fact, that is what the motion picture industry did when it was just getting started in the early 1900s. During World War I (1914-1918) millions of people suffered from hunger as food supplies and farmlands were destroyed. American relief efforts, led by Herbert Hoover and many charities, came to the rescue. Even after the fighting stopped hunger continued. Reconstruction from the war was a big enough task. The European nations were not yet able to produce enough food to sustain themselves. Hoover and other leaders had to find a way to fund aid for the hungry overseas. The film industry did not sit idle. They took action. Theatres around the country hosted a special Sunday matinee on January 29, 1921 with proceeds going toward European relief. Motion picture actors made appearances encouraging people to attend the event. There was even a contest to see which theatre could collect the most donations. Hoover’s memoir said the Motion Picture Campaign raised $169,000 to help feed Europe. This fundraising event coincided with a series of Invisible Guest Dinners that also raised funds. The invisible guest represented one of the hungry children in war-torn Europe. 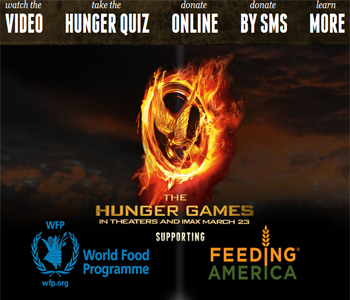 In fact the campaign and film inspired some creative fundraising by schoolchildren, including this story on the WFP site. The Hunger Games film also inspired some canned good drives. The more of this kind of social action, the better. At the time of World War I relief there was a great hope for peace, and for an end to both war and hunger. Those dreams have not been realized, at least not yet. It’s up to the current generation to keep up the struggle to achieve those goals. The film industry can be one of the leaders. Article first published as Movie Industry Can Help End World Hunger on Blogcritics. In my article Armistice Day, World Peace and Feeding the Hungry, I talk about the amazing work of the Belgian Relief Commission. They fed the hungry in Belgium, as well as Northern France, during World War One and in its aftermath. One of its anonymous donors was a woman who wanted to buy flowers for a friend’s grave. She wanted to mourn. But she also was aware of the Belgian relief fund which had been collecting donations. She considered the two choices and decided to spend the 2 dollars on the Belgian relief fund. 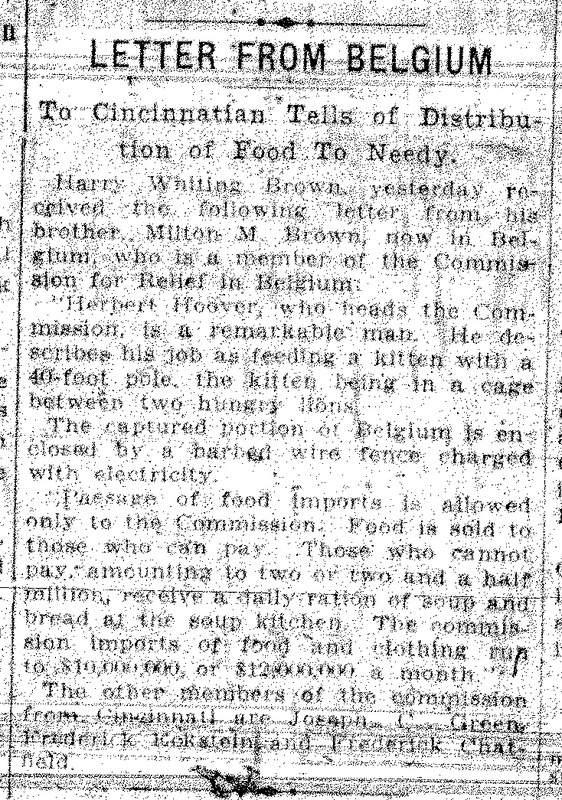 The Cincinnati Enquirer reported, “The possibility of saving a child in Belgium from starvation was the reason given” for her donation. On this Armistice Day, a two dollar donation could actually achieve close to two weeks’ worth of meals in countries suffering from conflict, natural disaster or extreme poverty. It could mean plumpy’nut to save small children from potentially deadly malnutrition; or it could mean school meals that not only prevent malnutrition, but help keep children learning in school. There are tremendous needs around the globe today, and many ways you can help. Catholic Relief Services has set up an East Africa Relief Fund to fight the famine and drought there. Save the Children is collecting donations to help feed and give medicine to victims of massive floods which have struck Thailand. Edesia, a producer of plumpy’nut, is holding a fundraiser titled the 11-11-11 project. Plumpy’nut is a special peanut paste desperately needed in many countries including Sudan, Guatemala, Afghanistan, Yemen and the Democratic Republic of the Congo. The UN World Food Programme (WFP) has a We Feedback campaign which is like taking in a Silent Guest, one of the world’s hungry, at your next meal. WFP also has the online game called Free Rice which raises money for the hungry, and is free for the user to play. To help those who are hungry within the United States, Feeding America supports a network of emergency food banks. Article first published as She Wanted to Mourn, But Chose to Save A Life on Blogcritics.